From shopping for your first home to seeing a doctor, the experience matters. But often we completely fail to grasp the degree to which it matters. Take the simple example of a greeting card. To the giver and the receiver, the value of that card is wrapped in its potential to convey a thoughtful emotion between them. It’s not the words and illustration, not the ink on the page, and not the paper it’s printed on that ultimately matter to customers. It’s the experience that all these parts come together to create. Whether we talk about greeting cards, mobile apps, or vacation get-aways, the experience is the product. From the perspective of customers, everything that goes into making up that experience — technology, materials, service support, or a supply chain — simply becomes the magic behind the experience. Yet the orientation and focus of our businesses is the inverse of this customer perspective. We plan around features and operational functions, leaving the customer experience as an unintentional byproduct of how the pieces and parts happen to come together for the customer. No wonder management of the customer experience can feel like such a nebulous affair to organizational leaders. Directly affecting the experience seems impossible because between you and it are IT systems, operations and processes, departments, and product architectures. It’s time organizations took a look at how we plan, manage, and organize around the experiences of customers. We live in a service-based economy. (The U.S. actually enjoys a $195.3 billon trade surplus for services. Many of the products we spend the most on and spend the most time with are platforms for services.) And in a service-based economy, the experience is the product customers buy. Back in 1931, Neil McElroy understood that businesses needed to focus on what mattered most to customers. McElroy was a brash and young marketing manager at Proctor & Gamble. He was one guy in a big manufacturing organization. P&G had already been successfully manufacturing soaps for years. They had many people and infrastructure dedicated to doing it. They were probably the best at doing it at scale. P&G, just like most other businesses in 1931, organized around business and manufacturing functions, such as the making of soap. But where P&G was vastly under supported, in McElroy’s eyes, was in the last step of delivery — how people learned about, perceived, and purchased soap brands. Working on an advertising campaign for Camay, one of P&G’s soap brands, McElroy became frustrated by having to compete against a more dominant P&G soap, Ivory. McElroy’s Camay brand was treated in an ad-hoc manner by management and manufacturing, because all eyes were focused on the big brand, Ivory. He wrote a now-famous memo, arguing that P&G needed to refocus by staffing whole teams to the management of individual brands. McElroy argued that a brand team should have the skills and attention to manage every aspect of marketing that brand, and the teeth to coordinate sales and manufacturing to support the brands. 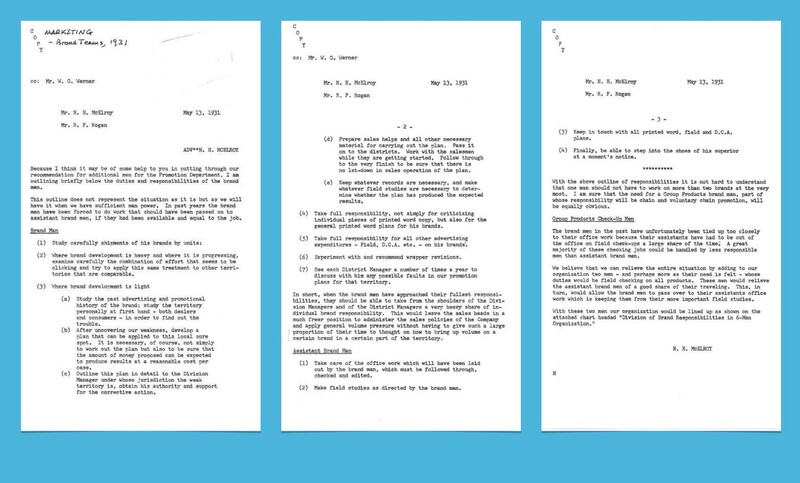 McElroy’s three-page memo exceeded P&G’s firm rule of a one-page maximum (gasp! ), but it also made sense. The rest of the story is that McElroy got his team, P&G was restructured into the brand-centric juggernaut is it today, and McElroy went on to become President of P&G. It was also the birth of brand management. So in the mid 20th Century, the U.S. was a manufacturing-based economy. What mattered most to customers wasn’t the manufacturing process. Customers weren’t buying an industrial process. McElroy and P&G helped bring about a refocusing of business on what mattered most to customers in a consumer product economy, the branded product. How soap is marketed is just as important as how it is made. In our experience-focused world, change happens fast. New systems, partners, and customers come in and out of play. User expectations change with every cool new thing from Google, Nest, Jawbone, Uber, Samsung, Apple, or Nike. Businesses work hard to manage the complexity, but the result is usually a painful customer experience, full of band-aids and rounded-off jagged edges. Low conversion and low adoption. People who enter a conversion funnel simply can’t make it through. Maybe the value prop resonates with them, but the pathway to it undermines what’s promised. A service anticipation gap forms where marketing is outperforming the experience. Mis-aligned or competing incentives. Who gets the sale when a customer uses the mobile app to pick-up the product in the physical retail store? Why try to sell a solution if you’re judged on product units sold? Attempting an experience that goes against the grain of incentives can feel like playing shuffleboard on velcro. Hundreds to thousands of one-offs. Exception cases, one-offs, and high-volumes of customer support interactions that are necessary to move customers and users through the service. Inefficiencies are rampant, and they only diminish the experience. No big picture. Leadership all the way down to the front line doesn’t have a clear picture of the experience they’re working to create. Decisions that affect the experience are made in the wrong context. It becomes all trees, no forest. Hoping to achieve a better experience by only working at the surface level of pixels, promises, and pleasantries most often leads to frustrations for people on both the delivery and receiving side of the service experience. The experience is too often the result — the outcome — of seemingly unintegrated parts, rather than the intended purposeful plan. It’s the difference between a good and bad restaurant. The bad restaurant has a wait, cold food, and hard-to-find staff. The good restaurant flows around your dining experience. It’s well-paced, suitably flexible, and focused on the experience of the meal. In the good restaurant the front-of-the-house and the back-of-the-house are in planned coordination. 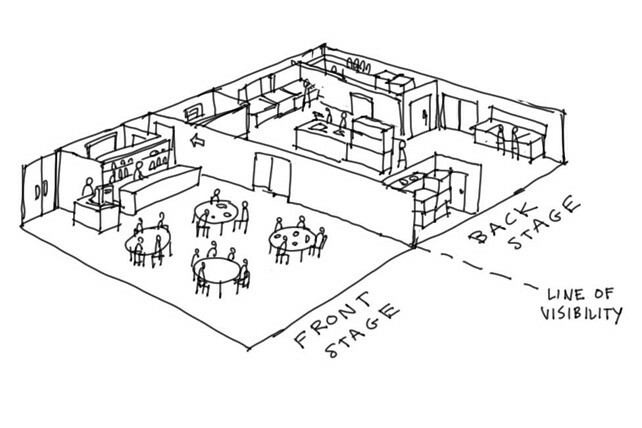 The experience was a forethought in the restaurant’s plan, not an after-effect. To make the experience the product, it must be envisioned, planned, and coordinated. If in a product-based world form followed function, then form should follow flow in a service-centric world. Operations, IT, and other business functions are still just as crucial, it’s just that the frame of reference for planning and coordinating them must be from the customer’s perspective looking in. Experiences are seen and understood by the business to be greater than single touchpoints and transactions. Experiences cross organizational silos and competing priorities. We created a Guide to Experience Mapping to help more organizations see the experiences customers are having. Teams are empowered to focus on an end-to-end experience, and incented to improve the associated business impacts. Their mandate isn’t to launch more features faster, but to create better experiences with better economic results. The competition isn’t about who launches the most, but who understands and serves the customer the best. The front and the back of the house are coordinated. We often call this orchestration, because it’s about helping people understand their part in a greater whole. It’s part subjective art and part rigorous science, and it’s covered in our Service Blueprinting Guide. Different experiences can be managed as a portfolio. Which will generate the best ROI this quarter? Where should the investment of money, time, and attention go? Where should business growth come from? P&G moved from a focus on manufacturing to a focus on brand in a manufacturing-based economy. Organizations today are moving to a focus on experience. That’s because in a service-based economy, how things are experienced is as important as how they are made.